This is from the New York Times, Easy, Mr. Fix-It By Joyce Wadler. The article is about how some people think home repair is so easy they can do it themselves. It looks easy on TV and besides, we have this crazy idea that "smart" people can do anything, and those who work with their hands, do so because they are incapable of doing more intellectual work. So you cut out the foundation from under your fireplace so you can dig out your basement and add a pool table? Or how about filling your kerosene heater with gasoline? If it takes a college degree for such things, imagine what you can do with a PH.D? Things would be a bit different if all children had the opportunity to work with their hands, developing skill in schools. 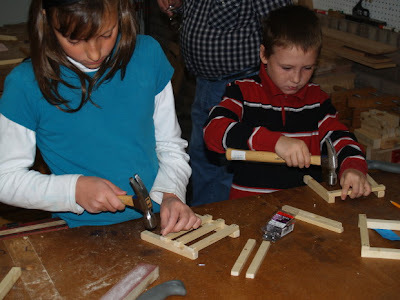 Educational Sloyd offered woodworking and crafts to all children, and one cannot help but wonder if the educational system in Finland may not owe its success to crafts in schools imparting a sense of dignity and respect to all human labor. Are men becoming less handy? When everything stops and your precious technology is a thing of the past what do you actually know how to do? I love the guy who can draft a will, that will help when you eat what you can grow or gather… Go for it, hand in your manhood (personhood really, women can be very competent builders) when it gets down to survival you’ll fall early and leave space for the rest of us." Others pointed out the pleasure they feel being competent to fix things and make things. Others told of their disappointment that their parents had not passed along the kinds of experience that would have given confidence. Still others complained that our schools no longer imparted skill and competence in physical reality. And of course there are two sides. 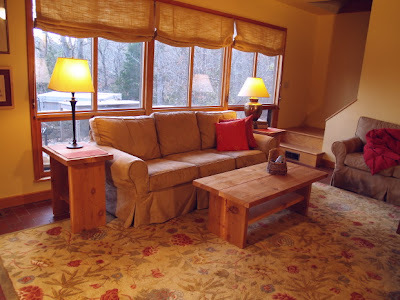 Some were concerned that if they tried to do something as simple as painting their living rooms, they would mess up and lose value in their home appraisals. It is funny what an incompetent society of investment bankers can do to property values and investment values in the course of a few short months without picking up a brush. Is there a relationship between the two? These are more questions you might ask yourself. If people had greater competence in real things, would we be facing such dismal economic prospects? Can it be that some common sense might have arisen in a society more competent to fix and make? As one comment observed, men and women with advanced degrees often believe they should be rewarded for their success by being freed of the more mundane tasks associated with daily life. Can you imagine attaining such a high degree of idiocy... one that deprives one of the joys available to those more deeply engaged in everyday reality? 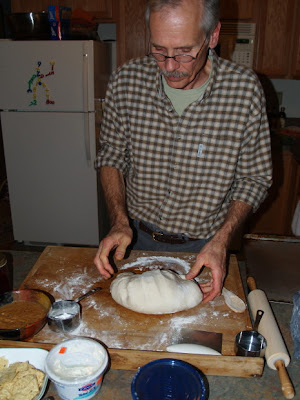 Every night for years, our friend Jim Fliss has made pizza on the bread board made by my wife Jean's grandfather. There have been thousands of pizzas. 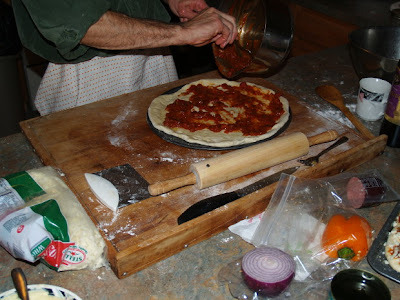 Years ago I adopted Jim's pizza tradition, not on Fridays, but at least once a week and added my own tradition of home-made sauce. 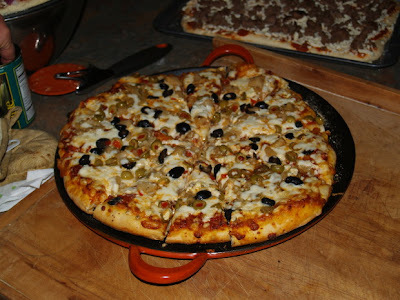 Today we combined efforts, Jim's crust, my sauce. 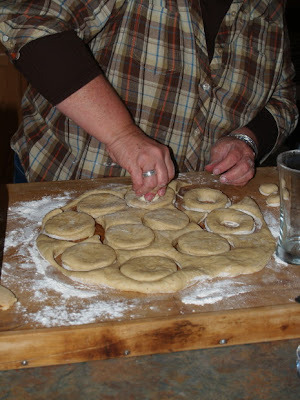 Hands-on traditions add ritual order to our lives, depth of friendship and meaning. Thanks Jim for getting me started with pizza and a tradition of my own. While the mind leaps quickly in flights of fancy, carrying us further and further from each other and ourselves, the hands as they develop skill create order, ritual, and meaning. "Why do you do it that way?" "Because my mother did." Those words might be regarded by some as a joke, but they describe behavior woven deeply into the fabric of life. Jim Thorpe was considered the greatest athlete of the 20th century, and when we are thinking about the hands and brain, it is important to consider the rest of the body as well. In scientific jargon, it is called embodied cognition. Jim Thorpe died in 1953, a pauper and alcoholic, and his wife talked the city of Mauch Chunk, Pennsylvania into building a monument and changing its name to Jim Thorpe, PA as a way of increasing its declining business opportunities. 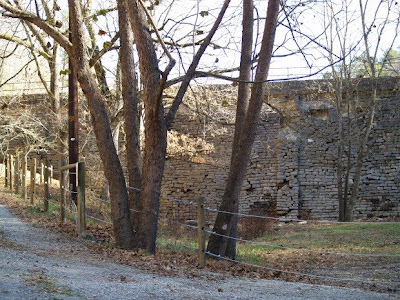 Jim Thorpe had never set foot in Mauch Chunk, but at the time, who cared? Even now, the city with the name of the world's greatest athlete is an interesting curiosity. And I love places that are textured, and preserved by caring hands. Now, Jim Thorpe, Pennsylvania is a center for tourism in the Poconos, and the downtown of Mauch Chunk is beautifully restored. Shown in the photos are the memorial statue with my daughter Lucy posing as modern day embodied cognition. 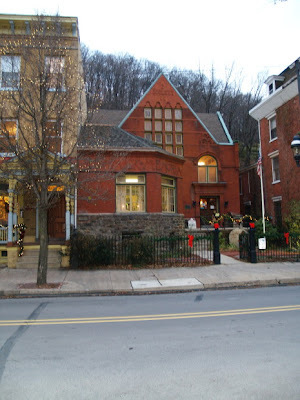 In keeping with the theme of intelligence and wisdom the second photo is the Dimmick Public Library, serving Mauch Chunk (Jim Thorpe) in this building since 1887. At last the meaning of it all. 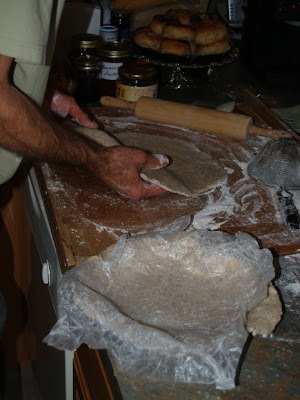 Days of preparation for feast. It turns out that the austere pilgrims planned to celebrate thanksgiving through prayer and fasting, and it was the Wampanaug Indians who set things straight. 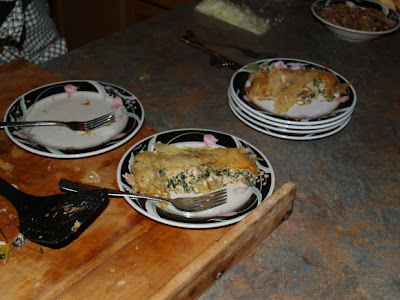 What better celebration for the love of family and community than that of preparing food and sharing it together. There is an artificial divide in America in which the work of the hands is regarded as being of lesser intellectual content. Mike Rose's book, Mind at Work is a great reminder that when it comes to the brain, all is not exactly as it may appear. Thanksgiving is another reminder. The hands never function in isolation from intellect, and the intellect, if it is to function with any degree of certainty and reliability, must involve the hands... whether in the making of things with beauty (and flavor) and utility, or in the exploration of the most abstract concepts of science. 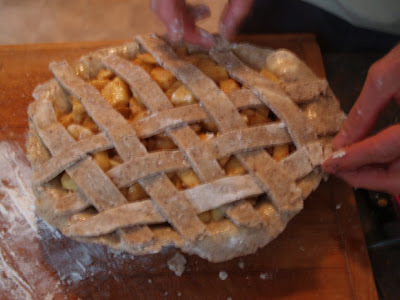 So what you see here is the American classic, Apple Pie. 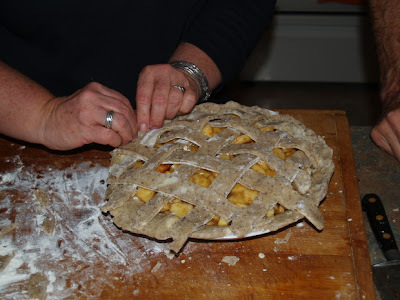 I will remind my gentle readers that it is far, far better to explore your relationships to reality and interpersonal relationship by baking, fixing and making in your own hands. 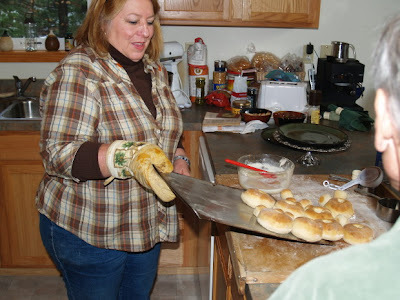 Enjoy this Thanksgiving day by putting your hands to work. Share with friends for the most satisfying results. 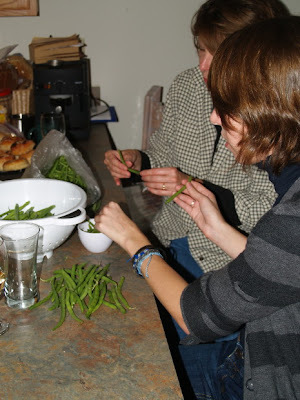 My daughter Lucy arrived so she went right to work preparing beans for tomorrow. In the meantime, we do have to eat. 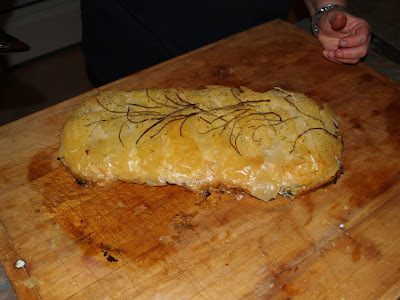 Jane made vegetable strudel. The pumpkin pies are in the oven, the turkey is ready for the roaster. Whether or not the potatoes should be peeled or not was a matter for discussion. A decision was reached. No peeling. The mashed potatoes will be made, skins and all. It doesn't stop. Pies and cake! 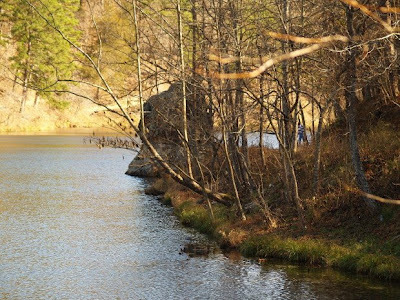 You want to take a break from cooking and eating now and then for a walk in the woods. 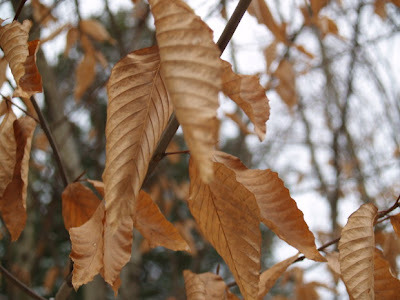 The leaves above are beech, and they often hang on all winter until the new buds push them loose from the stem. My contribution to Thanksgiving is to chop. 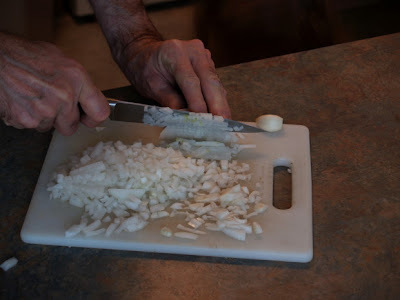 Small, but what I can do, and a sharp knife makes it more fun. The quality of your tools can have profound effect on your enjoyment of the work. The following link is to Art Therapy Changes Lives blog. The article mentions Ellen Dissanayake whom I met in Finland in September, but most importantly describes Kelly Lambert's theories about how the hands engage neurological circuitry in the brain that offsets symptoms of depression. 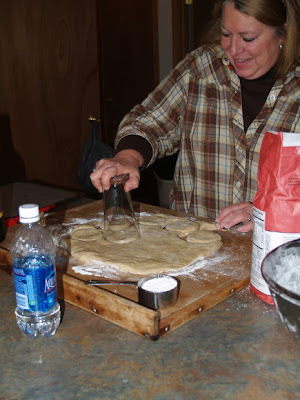 The effects are real whether you are making music, traditional crafts, or cooking a fine Thanksgiving dinner. We create the need for pharmaceuticals to moderate mood and behavior by our neglect of working with our hands. 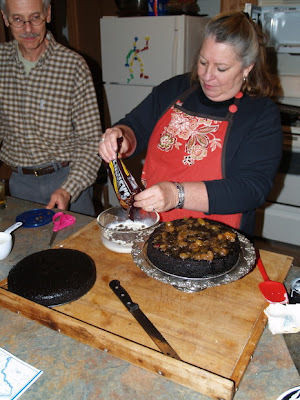 So if in doubt, these holiday seasons, cook, make and be merry! 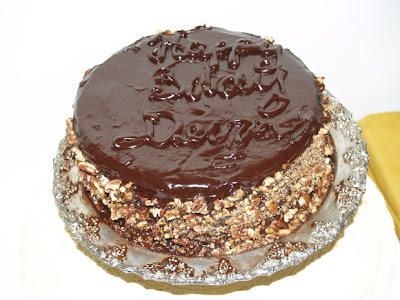 Baking is Jim's favorite thing in the kitchen, whether we are talking about cookies, pizza, pretzels or fresh bread. 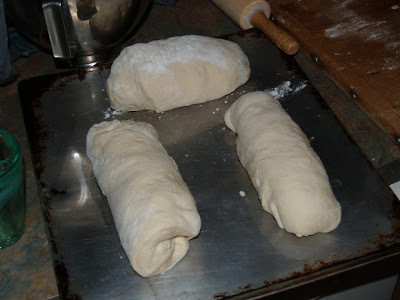 What you see here is bread. 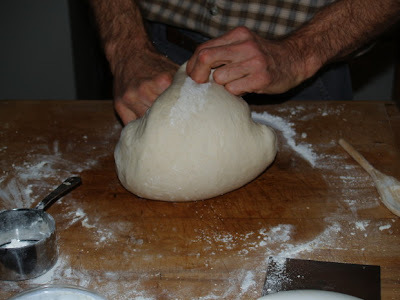 It started out as ingredients in the Kitchen Aid, then was kneaded, brushed with egg, sprinkled with parmesan or kosher salt. And what you won't see here is me eating. I can't take photos and eat at the same time. Happy Thanksgiving to you all. 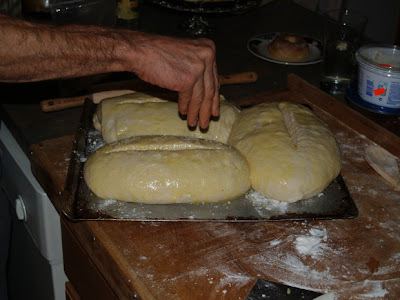 And what you see here is the Wisdom of the hands as they are set free in the kitchen in preparation for the holiday! 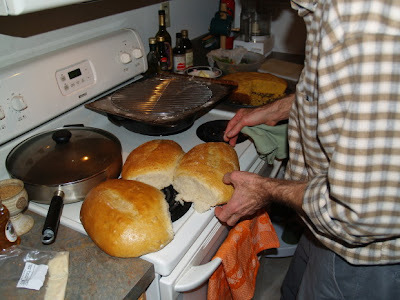 One of the wonderful things about Thanksgiving is the oppoturnity to spend time in the kitchen. 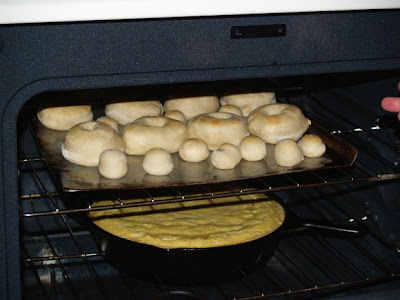 This Thanksgiving I'm spending with wonderful cooks and what you see here is the process for making oven baked doughnuts from the Fanny Farmer cookbook. 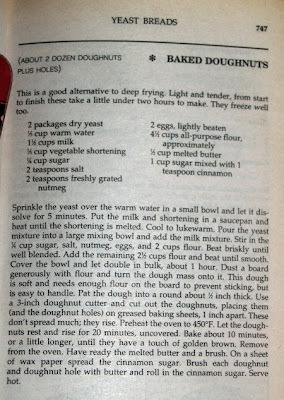 For the recipe, see the photo at left. 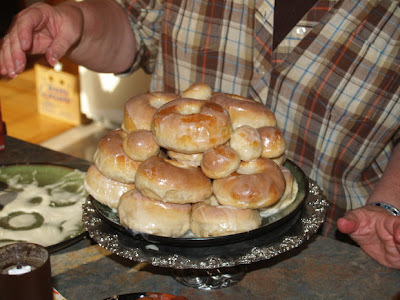 A place that Jane recommends is Cooking For Engineers where you can even learn to make your own marshmallows! You might want to try Ready Made Magazine as a source for Holiday ideas that cost nothing. It is not the place to go to find projects that take high levels of skill. Those can come later. The important thing is to get started. Black Friday is coming soon. Prepare for it by avoiding the malls this holiday season. Your life could be filled with the light of your own creativity! Make something instead! Over the past couple years, I've been telling my readers (you) about the unreality of our economy, the ridiculousness of thinking that MacMansions were reasonable investments, and of course, I was sort of hoping I was completely wrong. Oh well. During Bush's rush to ill conceived war in Iraq, I was hoping I was wrong about that too... that he knew something that I didn't about how the world works. Being somewhat smart and right about seeing the stupidity of things isn't really a whole lot of fun, but it is the price I pay for being hands-on engaged in reality. OK, so what do we do now? The first things are to begin saving money and building skill. This Christmas is a great chance. Sure you could do your part to sustain our irrational economy, but if you listen to the experts, you will know that you should be taking steps to protect your family finances. Plan to make your presents this Christmas. You still have 4 weeks to make things. If you need to spend money, use it to buy the tools and materials you will need to make beautiful things. 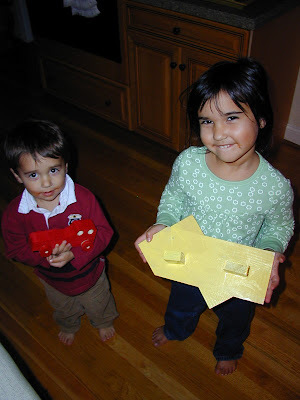 In the process you may learn that you have skills, talent, and that you can have more fun making things and sharing things you have made than you will find sharing gifts that came from the mall. 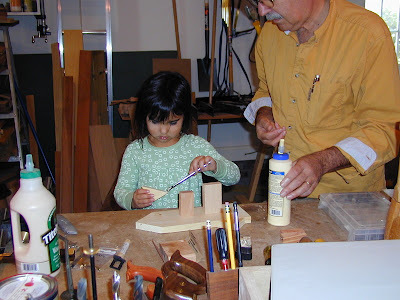 At this point, I have published 5 books about how to make stuff, ranging from interesting boxes to tables. But with a bit of imagination, you can design and make your own gifts. This next week, retail businesses are looking forward to black Friday, one of their biggest days. Make it a white Friday, a full of light Friday for yourself and your family. Turn off the TV, make a trip the hardware or lumber store and chart your course to creativity and solvency. This is the kind of work I was doing in about 1980. 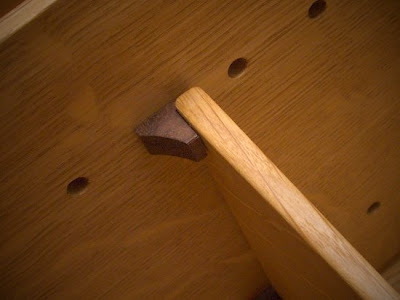 The small cherry table is made with mortise and tenon joints, wedged with walnut. 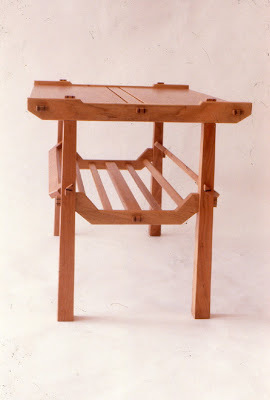 This series was the point at which I began dividing tables in the center to allow for expansion and contraction of wood... a concept which led years later to my article on table design in Fine Woodworking, "A Fresh Take on Table Tops." While this may seem to have little to do with the hands, I've been thinking lately about Albert Einstein. Like many creative individuals he had some of his greatest sparks of creativity in his middle years, and then spent the balance of his life, teaching, explaining and exploring the implications of earlier insight. I find a slight parallel in my own life as a craftsman. Many of my best ideas came when I was much younger, and now I am blessed with the opportunity to explore and refine their applications. Einstein turned his attention from the physical workings of the universe to its moral and ethical dimensions. Please bear with me as I do the same. There are some interesting connections that I discovered on Wikipedia. First is that Einstein was part of the Ethical Culture movement founded by Felix Adler, founder of the Working Man's School (now Fieldston Academy) in Manhattan. Adler was an outspoken proponent of manual training for all children as a means of imparting a moral dimension to their education. Second is that Einstein served on the board of the First Humanist Society of New York founded by Unitarian minister Charles Francis Potter. His religious beliefs would be regarded as consistent with those of many modern day Unitarian-Universalists. There is a profound connection between the scientists' striving to explore and understand the workings of the universe, and the craftsmen's efforts to explore and create. Both are moral acts beyond the didactic discourse of religious principles and externally imposed morality. To make is always an act of ethics and an expression of morality, and the impulse that drives the craftsman to make objects of beauty, utility and lasting quality is the same impulse that drives the scientist in his or her speculations about the nature of our reality. Don't we long for a return to intelligent conversation about education? This is from John Dewey, 1902. Our school methods, and to a very considerable extent our curriculum, are inherited from the period when learning and command of certain symbols, affording as they did the only access to learning, were all-important. The ideals of this period are still largely in control, even where the outward methods and studies have been changed. We sometimes hear the introduction of manual training, art, and science into the elementary, and even the secondary, schools deprecated on the ground that they detract from our present scheme of generous, liberal culture. The point of this objection would be ludicrous if it were not so effective as to make it tragic. It is our present education which is highly specialized, one-sided, and narrow. It is an education dominated almost entirely by the medieval conception of learning. It is something which appeals for the most part simply to the intellectual aspect of our natures, our desire to learn, to accumulate information, and to get control of the symbols of learning; not to our impulses and tendencies to make, to do, to create, to produce, whether in the form of utility or of art. The very fact that manual training, art, and science are objected to as technical, as tending toward mere specialism, is of itself as good testimony as could be offered to the specialized aim which controls current education. Unless education had been virtually identified with the exclusively intellectual pursuits, with learning as such, all these materials and methods would be welcome, would be greeted with the utmost hospitality. 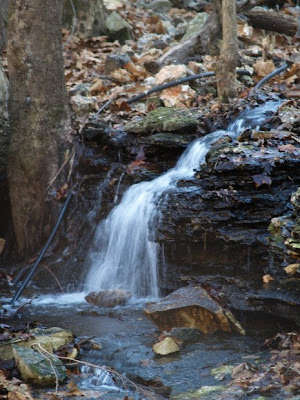 When we started the Wisdom of the Hands Program at Clear Spring School, it was based on my own reflections on the idea of wisdom in a time when knowledge and intelligence are the dominant concepts and measures of meaning. We are after all, in what has been explained as the "information age." What I would prefer is that we move as rapidly as possible into an age of wisdom. One of the most common notions of wisdom is that it "comes with age." And yet, as we have discussed the last couple days, you can spend a lot of time doing the same dumb things over and over and not necessarily get wiser in the process. So what follows are my attempts to clarify the concept of wisdom as distinct from knowledge. Can do it well and explain it, and cognizant of its broadest implications, share it with others as expressed wisdom. Knowledge comes from a variety of sources: conversation, books, radio, instruction, television, personal observation. Knowledge may be acquired either directly or from a third party. Wisdom emerges from reflection on personal and collective experience. Wisdom involves understanding the relationships between seemingly disparate events, concepts and things and is expressed as action toward improvement of the lives of others. You can spend a lot of time doing dumb things. Or you can live your life as a conscious learner, engaged directly in ALL things human, including the exploration of physical reality through the creative engagement of your own hands. You can choose. May the age of wisdom begin. It turns out there are two Joe the Plumbers, though of course there are thousands more. One of instant and greatest notoriety is really named Sam, lacks license and owes back taxes. Another, Joe Cottonwood, A.K.A. Joe the Plumber or in French, Joe le Plombier is really named Joe, is currently a general contractor and writer, and maintains a blog called Clear Heart Blog: The heart of a carpenter. He became "Joe the Plumber" when his first novel Famous Potatoes was published in the US and his occupation was listed on the back cover as "plumber." He became Joe le Plombier when his book was translated and published in France. When people are characterized, joe six-pack, joe the plumber, and are used in the media to make arguments, and to frame debates on ideology, real people are diminished in stature. We have a vast gulf in America, distancing the characterized "elite" from the characterized "working man." One of the objectives of Educational Sloyd was the elimination of that gulf. We seem to share that objective today in a way. Look at all the college scholarships being offered to minority children who show promise in academic subjects. You can go to the best ivy league schools for free if you are smart enough and poor. But educational sloyd used a different strategy to bring a more thorough result. 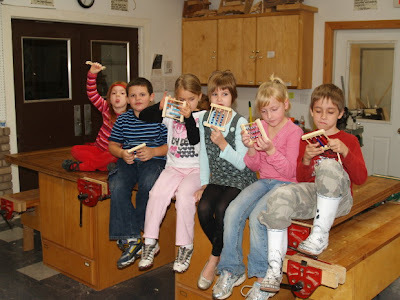 Put tools in the hands of all children. 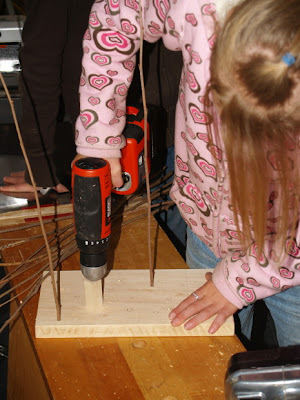 Challenge all children in the problems of creating quality work and workmanship. Unless all people understand the dignity of real work and have experience in the effort and the rewards of that effort, we are characters to each other instead of fully dimensioned human beings. And those human beings at the top of the chain will continue be completely out of touch with the needs of the American people. Joe Cottonwood writes eloquently about tools and real life, so his blog is something you might enjoy. Today in the wood shop at Clear Spring School, the 9th and 10th grade students started their work on the annual toy production for the Eureka Springs food bank. the 11th and 12th grade students will go on a field trip as part of their art appreciation study. We will visit working artists in their studios. In the meantime, when I checked my mail this morning, I found a small package from Andrew Reeson, A.K.A. Funky chicken, from the Australian woodworker's forum. Funky Chicken sent me the pen as shown in the photo above. It is an amazing work of art by any standard, and is made even more special when you realize that Funky Chicken is in high school. I have yet to find out what kind of wood it is. Or to thank Funky Chicken for his precious gift. But it makes a guy feel pretty special to receive such a thing and to know something like this is given not just to care for but to use. (on special occasions). I've pondered the notion of "real experience" vs. "time experience" quite a number of times over the years. To sum it up my conclusions, there seems to be a split between "experience with continuous learning" and the "experience of doing the same thing over and over again." Perhaps a bit more cynically, the real question is, for example, does someone have 20 year's experience or do they have 1 month's experience 240 times? I want to return briefly to another subject that I mentioned earlier. When conservative commentator Laura Ingraham said that Sarah Palin's appeal wasn't just to the Joe the Plumber types, but to "smart people as well". She illustrated the failings of the Howard Gardner "Frames of Mind" and "multiple intelligences" concepts to penetrate the thinking of the "intellectual elite" in America. In the thoughts of too many Americans, plumbers are dumb. People who work with their hands are those incapable of more intellectual pursuits. For the conservatives of America, Joe the Plumber and his kind are know-nothings to be manipulated toward political objectives. But the truth is that there are no limits to the potential of the intellectually curious. The school system may numb the intellectual curiosity and confidence of most Americans. But intellect is not just about science, law, banking and finance. Inherent in the multiple intelligences concept are the seeds of dignity through which we nurture and understand the diverse intelligence and contributions of all people. We are desperately needing an affirmative action program in American schools, allowing all children, even those whose aspirations will lead them to the nations finest universities, the opportunity to work with their hands in the creation of real things... to be challenged by physical reality and tested in their aspirations of achieving quality workmanship. This is from the Google book about the chairmaking of Chester Cornett, Craftsman of the Cumberland by Michael Owens Jones. Joe says, "This is a book about Chester Cornett who measured everything by using his hands, thumbs and fingers and made beautiful Chairs while he was doing Sloyd and didn't know it." Thanks, Joe. A reader, Stephen, sent in this link "A Dress A Day" with an article about Malcolm Gladwell's book called Outliers: The Story of Success, and his suggestion that it can take 10,000 hours to master something. I think that would be relative to the starting aptitude and ability to pay attention to what you are doing and having sufficient role models to challenge you with continuously advancing targets for growth. Of course the point is that: "Hey, folks, if you want to do something, it may not be all that easy." A bit of quick math... Forty hours a week times 50 weeks per year times 5 years equals mastery? It certainly depends on lots of other factors, and for one fully engaged in learning, there are no limits. How do you really know when mastery is reached? Today I found a new way to make wheels as I prepare for our annual toy making project. 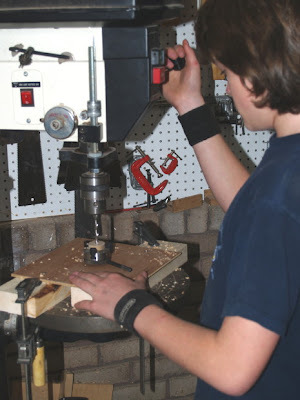 It involves the use of a lathe chuck mounted to the drill press table, which precisely centers the wheel on the drill press as the axle hole is drilled. 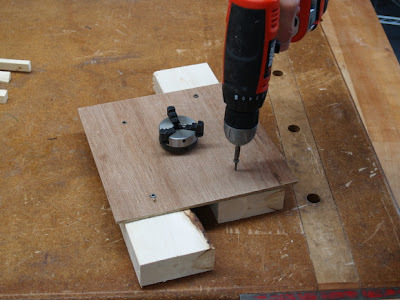 First mount the chuck to thin plywood, screw it to a base that can be clamped to the drill press table, and align the chuck so the drill hits the center. The great thing about this small advance is that I can have the kids drill wheels and not worry about their safety or about their attention wandering and holes becoming off center. This morning the Clear Spring school third and fourth grade students finished their Sloyd trivets and began making their rain forest models. Before starting, they eagerly shared with me what they had learned so far, about the various layers and the life to be found in them. In making the models, the students start with a block of wood and after it has been sanded, they gather sticks that can be used to create the 5 layers of rain forest life, with the longest sticks being the "emergent" layer. It is a great way to learn more and have fun learning, and two years ago when we did this project before, their entire classroom became a jungle filled with their models and other memorabilia from their study. The first and second grade students made shallow boxes today for their dioramas of American Indian life. They made teepees using canvas cloth and the sticks we gathered during a hike in the woods two weeks ago. Today I received copies of the December/January issue of American Woodworker featuring Clear Spring School in the school news section. It is a nice article that I hope will bring greater national attention to the school and the Wisdom of the Hands program. The photos are of finishing a trivet and drilling for the sticks to fit in the rain forest model base. 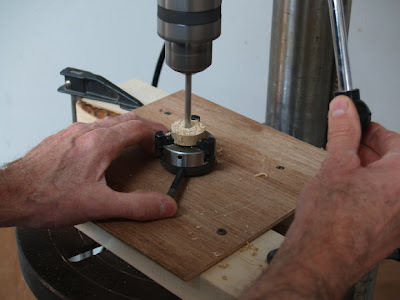 The block of wood covering most of the drill bit is to prevent it from drilling through the board and into the work bench. One of the gifts I received from my wife on my 60th birthday is Spike Carlsen's A Splintered History of Wood. It is the kind of book you could read all the way through, or just open a chapter for a quick round of diversion from the pressing weight of the news. 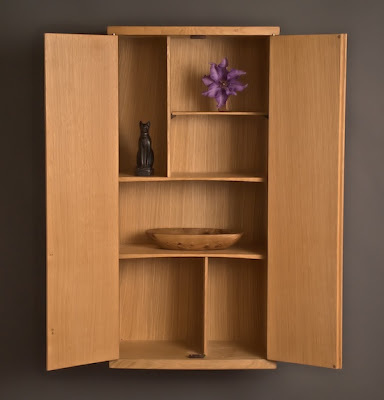 In any case, it illustrates how deeply indebted we are to wood as a material for survival and for the creative expression of our most human qualities. Spike Carlsen makes the point early in the book that we would not have developed as human beings without wood. I would add that wood is kind of like the hands. We would not have become the species we are without the development of hands. Now put hands on wood. For some of us, that simple situation allows us to express and experience the essence of our humanity. Shown at left are two rustic wall cabinets, the first from the book and the second from the DVD. Both should be available for purchase in the fall of 2009. I have been clearing up branches, and cleaning the wood shop for the next set of projects. In the meantime, my finish room and office and even my office wall are filled to the brim with projects that will need to find new homes. Today, I finished my part of the Rustic Furniture Basics DVD. I finished my 6th book last week, and have started my 6th decade today. So I am entering a brief stage of consideration. I will thoughtfully consider what comes next. Yesterday I had a brief scare. I started making the chair as shown and it was wiggly. So I added additional bracing. For a few minutes I wondered whether what I had planned was all wrong. But after you've made enough mistakes, and when you know that mistakes are what lead you to refinement and reflection, you begin to appreciate them. So, this isn't my favorite chair but it is complete. Come on over and you can sit in it. 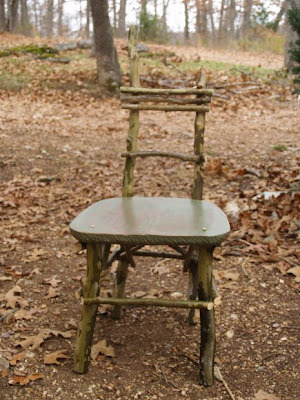 Richard Bazeley sent the photos below, one of a rustic chairmaker in a local festival in Australia, and the second of one of his 7th year boys testing the same technique in his classroom. The third photo is of his students testing their balsa plane models in first flight. Just in case you were wondering about Wall Street Read this. 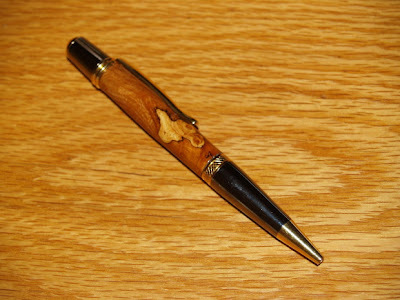 My Woodwork Magazine articles about Educational Sloyd are now available on-line through the American Woodworker website. My 60th birthday is Saturday. Normally I don't pay much attention to birthdays, but this one seems to catch me at a pivot point in things. Six months ago, I wondered if I could go to Finland and still get my book and DVD completed on deadline. Now, I am back from Finland and have the last of the text and photos submitted for the book. This weekend Gary Junken will be here again to do the last shots and voice-overs for the DVD. And earlier in the week I got my holiday orders filled. My projects are coming to completion at the same time and it opens the door to wonder "what comes next?" Richard Bazeley described in an email, going for a walk-about as he was planning his lessons for the next day. He discovered the weebill's nest in a Eucalyptus tree. Making discoveries, no matter the size, creates space in the imagination for new things to enter, fresh "insight." So Richard arrived home with plans intact. I, too, will be going on walk-about as I use my imagination to discover what comes next. When in doubt, there is no better way to discover oneself than to use one's feet. Is there a connection between sole and soul? Try a walk-about with me and report back. Mine will start Sunday. I've been taking beauty shots for the rustic furniture book today, and these are the western cedar tables from chapter one set up in our living room. Today in the Clear Spring wood shop, the 5th and 6th grade students have been working on sliding book racks based on some I designed in a craftsman style. In order for these book racks to work, they have to be done with a great deal of precision. So, we have standard operations that each student must complete on the same tool set-up. But when those things have been completed, each student wants to be responsible for his or her own decisions on design. Walking that fine line between things working efficiently and the potentially disastrous decisions that unskilled workers could make on an assembly line concerning design would present some real challenges in American industry, but one of the problems with American industry has been the impersonal quality of it. Men and women are not designed to be cogs in a machine, so some may say, dispense with it. Forget about it. But men and women can be inspired to take part in things larger than themselves when they see what they do as essential to the welfare of the nation. We know the old saying about turning swords to plowshares... diverting destructive capacity toward the good. Think of the auto industry in the same light. The photos below are the work of Marcus Sly in Wales. I limit my use of machinery. Much of the work is done by hand and by eye. Work made like this has a sense of presence and "soul" which is generally lacking in mass produced items. The difference between the feel and character of something handmade and something which has been mass produced is startling; handmade things help us to create beautiful, soulful and inspiring places in which to live, work and dream. 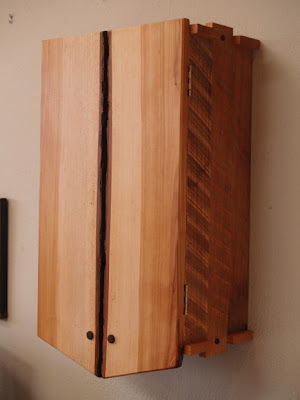 More can be found on his website: Handmade Furniture by Marcus Sly. Now, they are talking about a "bail-out" for the auto industry, and of course we would be bailing out the banks first. My economic theory that people will invest only in those things they understand comes into play. Because we have moved so strongly away from manufacturing and creative making in schools, the manufacturing in America has been severely under capitalized. That means it lagged behind its overseas competitors in the development of new technologies, and efficiency, and its products suffered. The only way it has managed to compete at all over the last few years has been by making over-sized technologically retarded behemoth gas guzzlers for the intellectually and morally challenged American public which seems to have recently come to its senses as a result of inflated gas prices and declining job market. So now, we are being asked to invest American tax dollars in what has been a declining industry. You just know the bankers won't get it. They, with few exceptions have made little or nothing real in their whole lives. They just won't understand what it means to be creatively engaged in making something that is real. But I think we should give it serious consideration. So of course, the challenge is to develop an auto industry that does much more than the same old stuff. Can it become the heart and soul of the creation of the green industrial revolution that we so desperately need, liberating us from our fossil fuel dependency and addiction to foreign oil? Here, I'm not just talking about greener cars, but also the wind farms to power them. There is always reason for hope that from crisis, opportunity will emerge. It was a busy day today at Clear Spring. 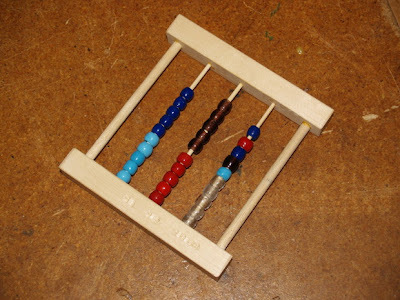 The first and second grade students made abacus for studying their math. The 3rd and 4th grade students worked on Sloyd trivets. 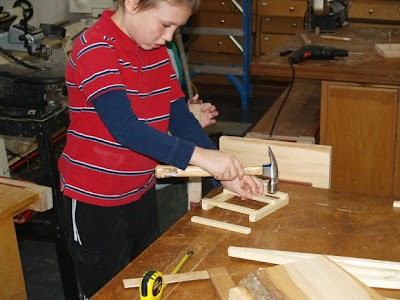 The seventh and eighth grade students worked on their scroll sawn continent puzzles and the 9th and 10th grade students came to the wood shop at the same time and worked on carving. 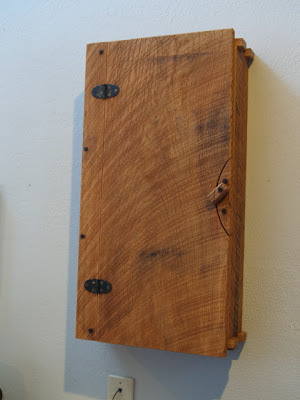 In addition, my helper Bob brought in a piece of his work for show. 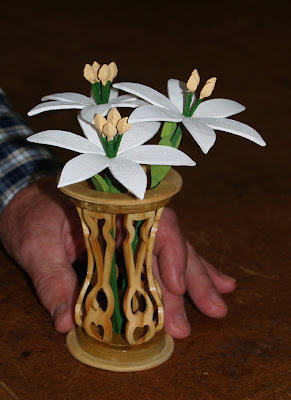 The flowers and vase at left were cut out using a scroll saw. Hands A nice post on the hands at MollyChicken.